A well-appointed kitchen is a requisite in any residence. Just because you're renting doesn't mean you have to live with a less-than-stellar cook space. Craving a revamp? 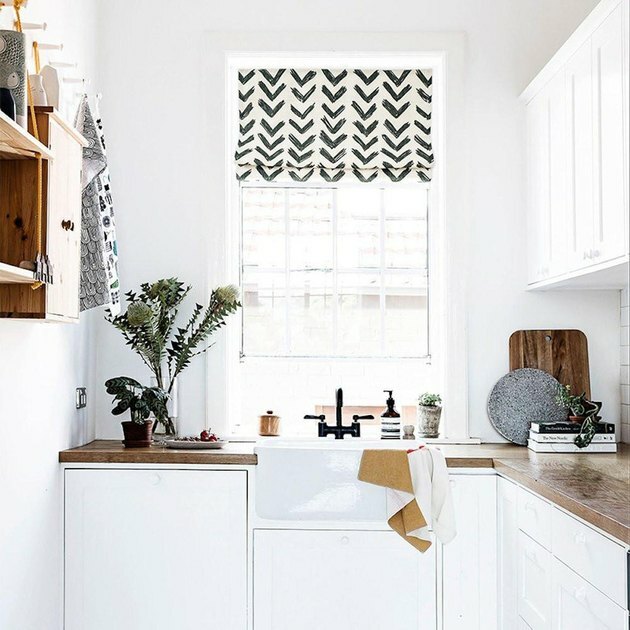 From quick fixes to affordable overhauls, scroll on for 14 rental-friendly ways to update your ugly kitchen without the risk of losing your security deposit. 1. 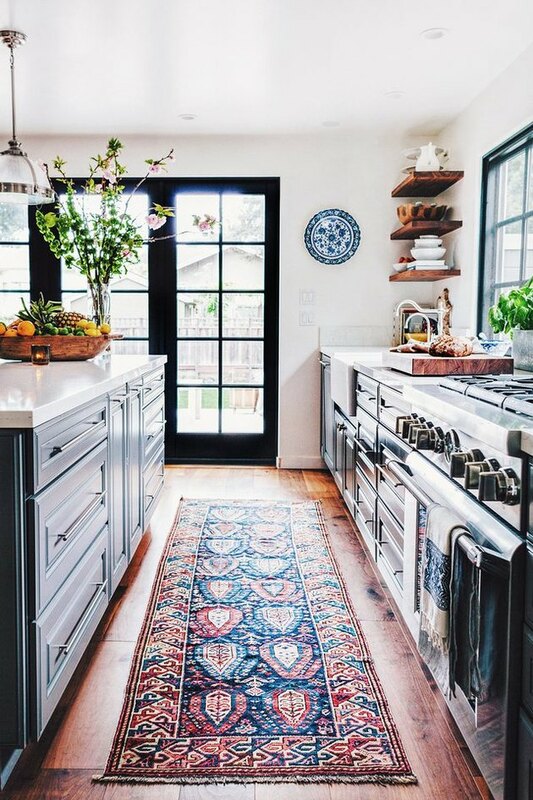 Opt for an area rug. Ugly floor? Hide it with an area rug. 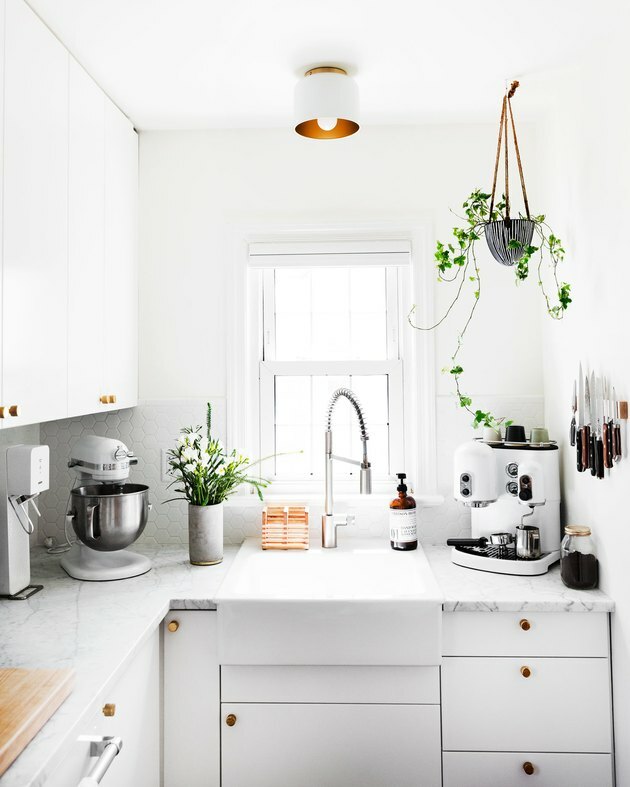 Whatever your style and kitchen layout, you'll find plenty of chic options. Pro tip: Be sure to up the comfort factor, and keep your rug in place by adding a non-skid pad underneath. 2. Install an indoor herb garden. Take farm-to-table to the next level with an indoor herb garden. Consider planting rosemary, mint, basil, sage, oregano, and thyme. Pro tip: Optimize sunlight by hanging it in front of a south-facing window like Amber from The Bird and Her Song did with this clever DIY project. 3. Remove upper cabinet doors. Dreaming of open shelving? 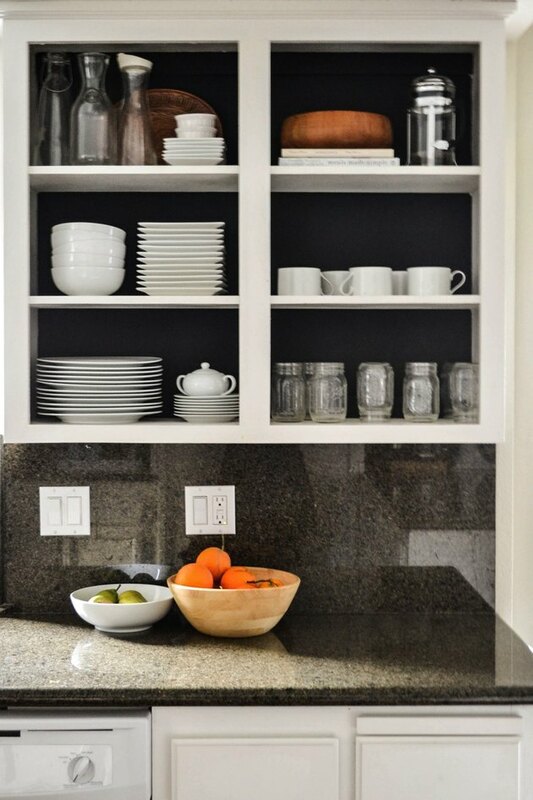 Simply remove your upper cabinet doors (you can reinstall them before you move out). 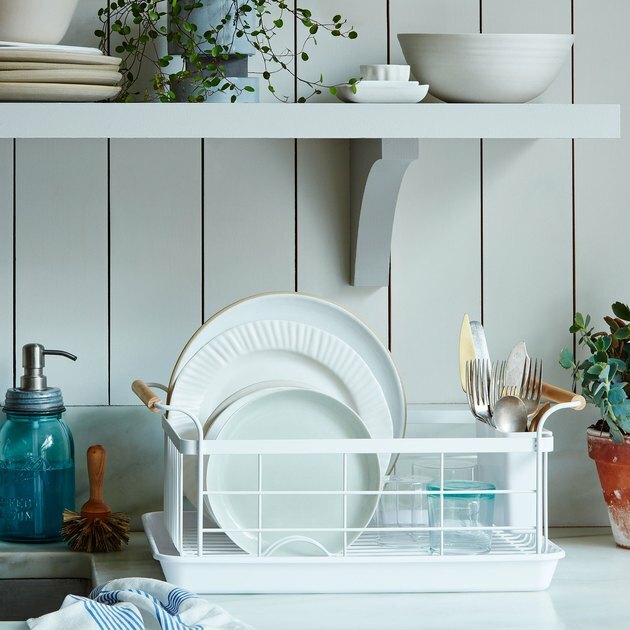 Strategically stacked dishes look super streamlined. Or, amp up the personality with an eclectic mix of plates, bowls, and glassware. 4. Punch up the color. Most landlords will let you paint, which makes this a really easy and inexpensive way to revive any room. 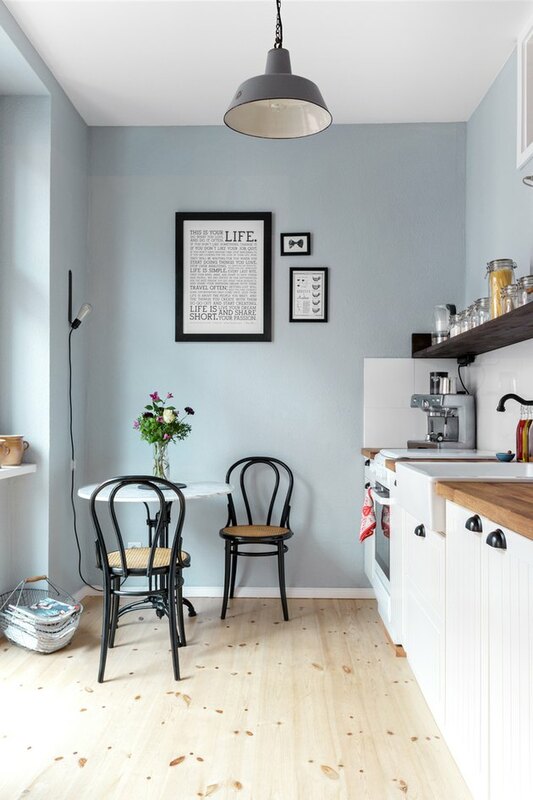 Yellows feel warm and sunny, while blues are super soothing, as seen in this rustic Scandinavian kitchen designed by Kathy Kunz. 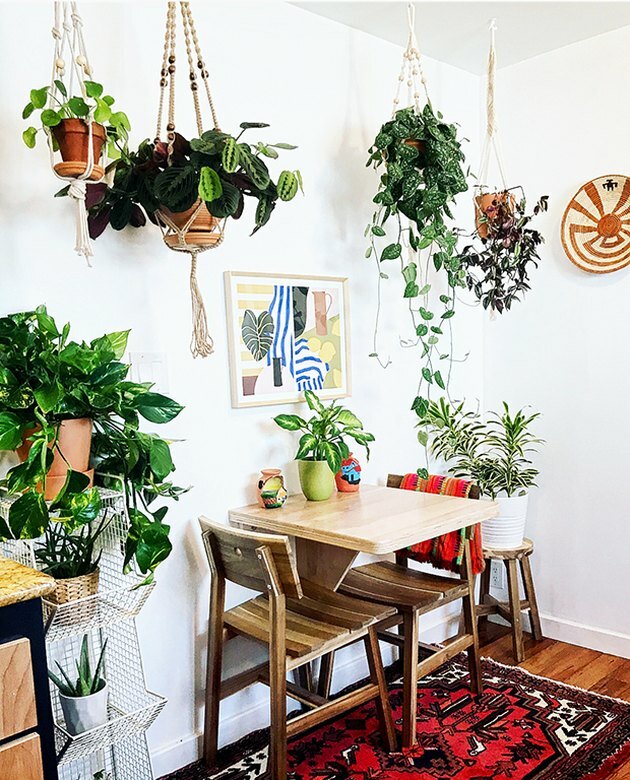 Turn your tiny rental kitchen into a plant-filled paradise. These green beauties will make it feel so much bigger. Plus, greenery is so homey and welcoming. Don't you think? 6. 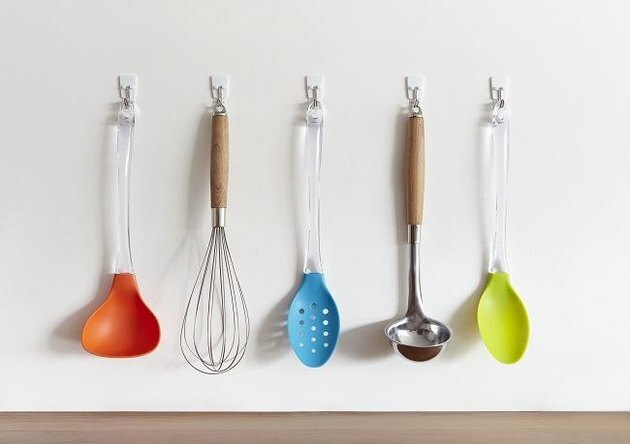 Hang cookware and utensils. Why shove pots, pans, and utensils in a cabinet or drawer when you can show 'em off? 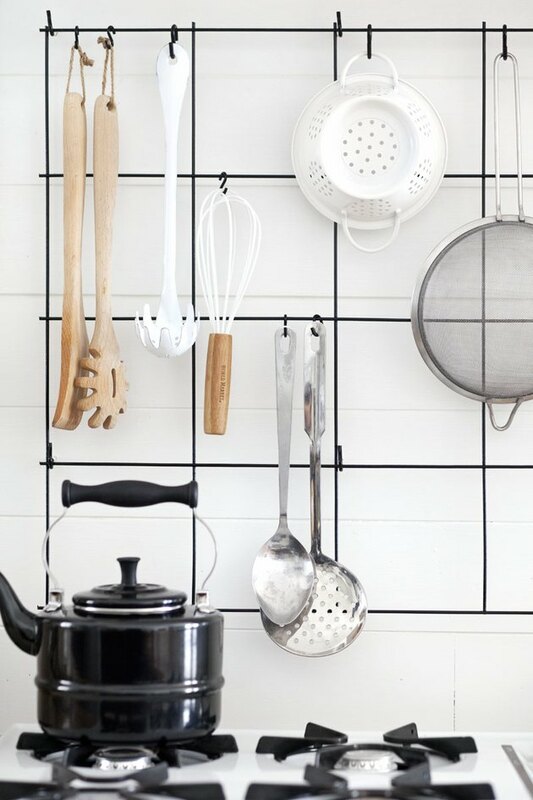 Use a hanging rack like this industrial-chic DIY option from A Beautiful Mess to display your prized cookware. 7. Or, opt for adhesive wall hooks instead. Short on storage? Free up countertops and cabinets by using adhesive wall hooks like these ( $4.49 for a pack of six ) to organize essential tools. 8. Get creative with window coverings. It's been said that windows are the eyes to the home. By this logic, drapery is like mega-volume mascara. Or would it be sunglasses? Whichever analogy you prefer, the point is that window coverings — like this fun Roman shade from Karuilu Home ( starting at $88 ) — are a smart and simple way to make a major statement. Sadly, it's unlikely that your landlord will replace your countertops — no matter how unattractive. But don't despair. 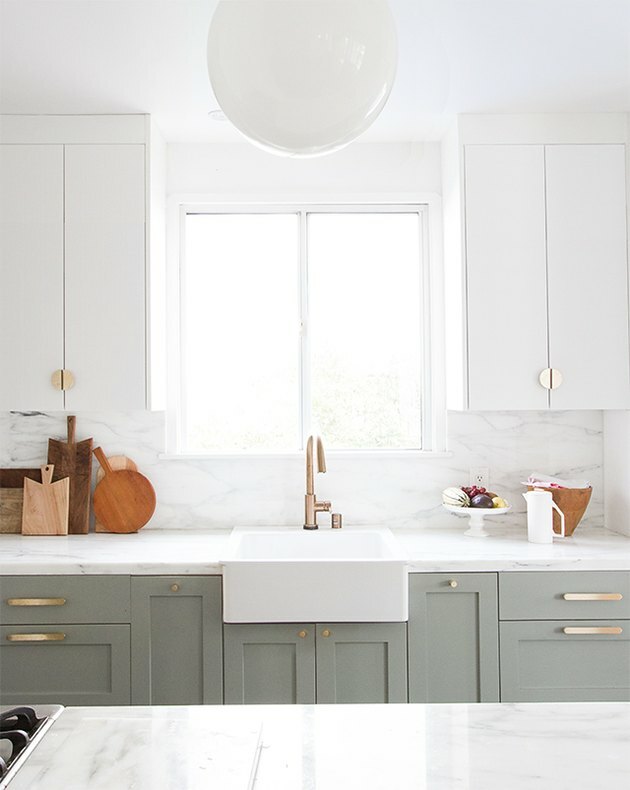 You can hide the hideousness and give your kitchen a faux marble upgrade with a little adhesive film — pretty and practical. You're welcome. Check out all the details here. 10. Buy a new dish drying rack. Sure, a drying rack isn't the most impactful accoutrement in your kitchen, but that doesn't mean you should look past it. You'd be surprised what a difference something like this wood-handled beauty ( $65 ) can make. 11. Change the lighting, sort of. Let there be light! 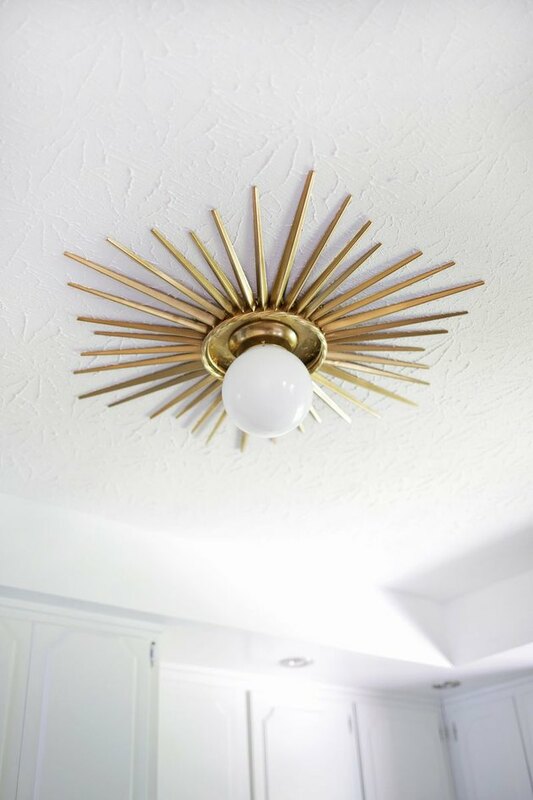 If your kitchen was cursed with one of those standard globe fixtures, give it a little upgrade with this chic DIY from A Beautiful Mess. Whether your aesthetic skews classic or contemporary, the right fixture can totally transform a lackluster space. 12. 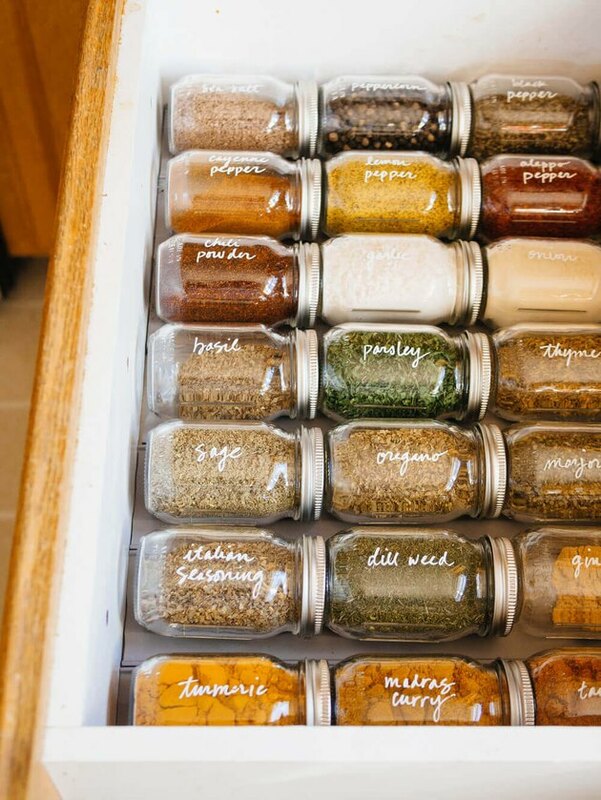 Show off your spice collection. 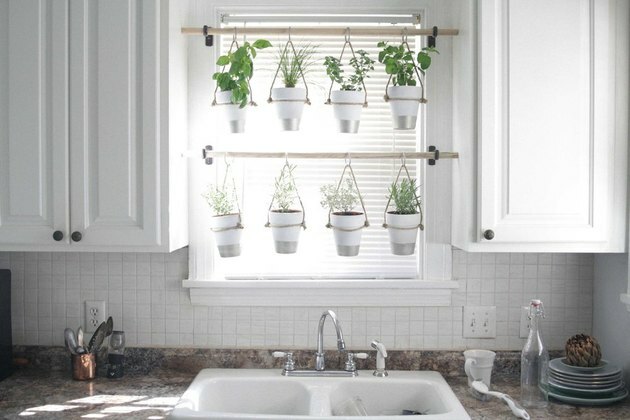 Spice up your kitchen! Store your go-tos in these adorable mini mason jars and keep them organized in a drawer. Check out how Linda over at Garden Betty nailed this brilliant DIY project. 13. Swap out the hardware. 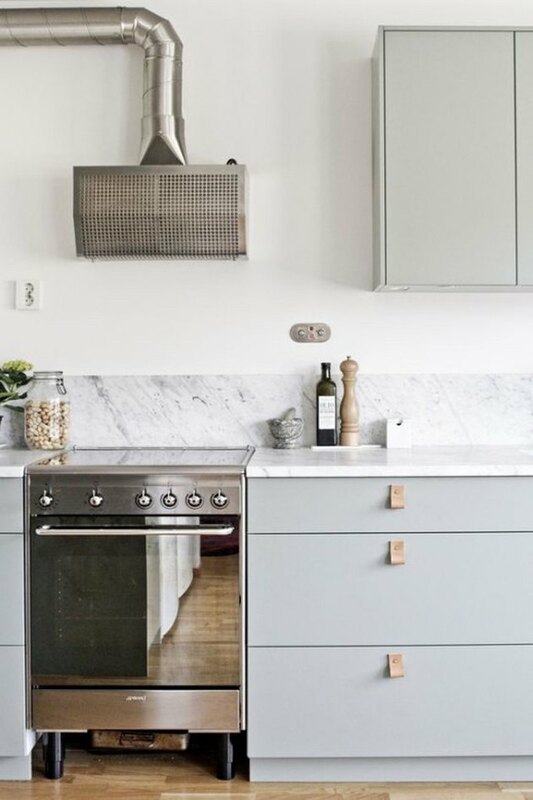 When was the last time you walked into a rental kitchen and said, "Ooh, I love those drawer pulls!"? Probably never. Well, no one should be forced to live with less than desirable cabinet hardware. And luckily, it's pretty easy to swap them out for something oh-so-modern-and-dreamy. 14. Add a removable backsplash. 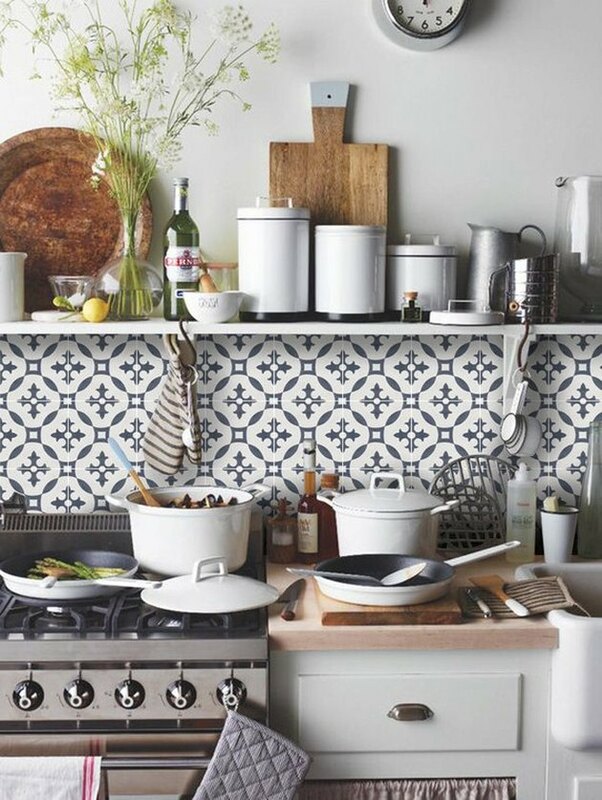 Been dreaming of a gorgeous Moroccan or Spanish tile backsplash? Well, dreams do come true ... even if you're renting. Thanks to peel and stick tile adhesives like these handmade vinyl gems ( starting at $39.95 for 24 pack ), you can get the look you've been craving without kissing your security deposit goodbye.